Starring: Bud Abbott, Lou Costello, Lon Chaney Jr.
Tag line: "Jeepers! The creepers are after Bud and Lou!" If I were to compile a list of my favorite horror comedies, It would probably include a few older movies (like Herschell Gordon Lewis’ Two Thousand Maniacs! ), a handful of newer ones (Shaun of the Dead and the underrated Doghouse), and, of course, Evil Dead 2, Return of the Living Dead, and Re-Animator (I couldn’t possibly leave them off). As with all lists, the trick is trying to rank them, which I always find difficult. But one thing is certain: 1948’s Abbott and Costello Meet Frankenstein, a damn funny film that doesn’t ridicule the Universal monster movies of the ‘30s and ‘40s so much as pay tribute to them, would be right up there with the rest of them. Baggage clerks Chick (Abbott) and Wilbur (Costello) find themselves in over their heads when they deliver a couple of crates to a wax museum. Instead of wax dummies, these crates contain the bodies of Count Dracula (Bela Lugosi) and Frankenstein’s Monster (Glenn Strange), who have come to America to find the Monster a new brain. For help, Dracula enlists a beautiful scientist named Sandra Mornay (Lenore Aubert), who sets out to seduce Wilbur (apparently, Wilbur’s “simple” brain makes him the perfect donor). Things take an even darker turn when Larry Talbot (Lon Chaney, Jr.), aka The Wolfman, suddenly appears. Hoping to stop Dracula from carrying out his evil plan, Talbot instead transforms into the Wolf Man whenever there’s a full moon, leaving poor Chick and Wilbur with yet another monster to worry about! With all due respect to Buck Privates and their “Who’s on First” routine, Abbott and Costello Meet Frankenstein is the funniest thing Bud Abbott and Lou Costello ever did. With Abbott playing the straight man, Lou has to deal with creaking coffins, moving candles, and a collection of monsters that are forever sneaking up on him. The comedy routines the duo put together are hilarious, and when it comes to milking laughs out of a tense situation, few have done it as well as Lou Costello (the scene where he’s standing beside a coffin reading the Legend of Dracula, only to be interrupted by Dracula himself, is hysterical). 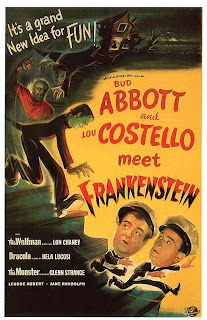 What’s more, Abbott and Costello Meet Frankenstein is also a pretty nifty continuation of the great Universal horror films, with Lon Chaney Jr. and Bela Lugosi playing the roles that made them famous (Glenn Strange, who portrayed the monster in 1944’s House of Frankenstein, joins in as well). I loved how none of these actors were out to get laughs; from start to finish, Lugosi and company approached the movie as if they were in a genuine horror film. Abbott and Costello Meet Frankenstein does, on occasion, satirize the classic Universal monster movies, but never once does it mock them. This, combined with some truly funny moments provided by its two stars, make it one of my all-time favorite horror comedies. I adored this film when I was a kid. But I have to admit that I haven't seen it since I was about ten years old. 48 years ago, that was. A great film. It makes a complete circle, a phrase I like to use that describes a movie that hits the target on all fronts, comedy, horror, frightening scenes and the music.